Here’s an easy recipe for those chilly nights when cravings run carb heavy. 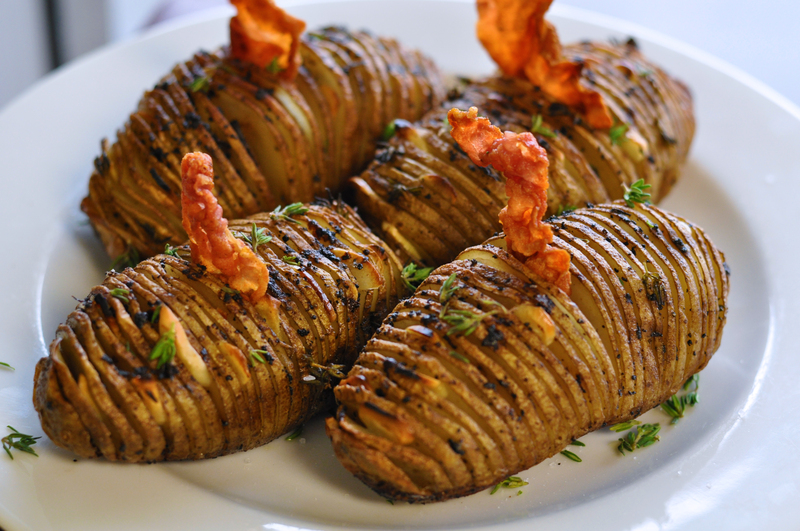 While tasty on their own, Swedish-style Hasselback potatoes are equally delicious alongside roasted meats, such as rack of lamb, venison medallions or beef tenderloin. Of course our version is slathered in black truffle butter before baking, which lends a subtle earthiness and keeps the interior moist. We crowned each potato with a ham crisp which gives a nice, salty crunch when crumbled over the top. 1. Preheat oven to 425 degrees F. Lightly oil a baking dish that’s large enough to hold all 4 potatoes without crowding. 2. Cut the potatoes: Using chopsticks or 2 forks as a knife guide, make several thin slices width-wise without cutting all the way through each potato. Set potatoes in baking dish. Season with salt and pepper. 3. Evenly distribute garlic slices and about half of the thyme in between slices of potatoes. Slather each potato with 1 tablespoon softened truffle butter, stuffing a bit in between some of the slices. 4. Bake the potatoes, uncovered, for 45 minutes to 1 hour, basting with the pan-drippings every so often. Until crisp on the outside yet tender on the inside. If the potatoes look like they’re starting to get too crisped, put a sheet of foil over them in the last 15 minutes of cooking. 5. While the potatoes are baking, make the ham crisps. Heat a medium skillet over medium high heat. Add a little olive oil. Gently lay each slice of jambon in the pan, without touching. Cook until crispy and browned, turning once. Set aside on paper towel. 6. Once baked, carefully remove each potato from the pan using a flat-bottomed spatula or tongs. Garnish with ham crisps and the rest of the chopped thyme. Once plated, top each potato with the remaining truffle butter. Previous Post More mushroom love!